Presents a unique Team-Building experience using Handbells. If you looking for something different to kick off a meeting or want to have an event to kick-start a project, consider this unique activity. 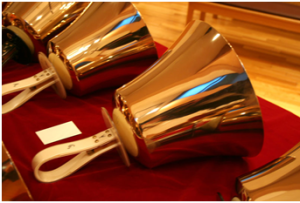 Handbells ringing is unlike any other activity, it takes attention, communication and co-ordination. The Handbell Team Building Exercise takes participants out of their comfort zone, gives them an opportunity to try something new, while at the same time building inter-dependency, interpersonal communications, cooperation and FUN! Organizations that have used this Team Building Exercise talked about the experience long after. Used as a stand alone activity or as a prequel to the SOCIAL STYLES workshop, it is guaranteed to be an effective and fun event.